CAMEX is it when it comes to the collegiate retailing industry! With more than 3,000 college stores coming to Kansas City, MO this weekend, we are ready to launch a big idea from our CEO – BudBag® mini-duffles! 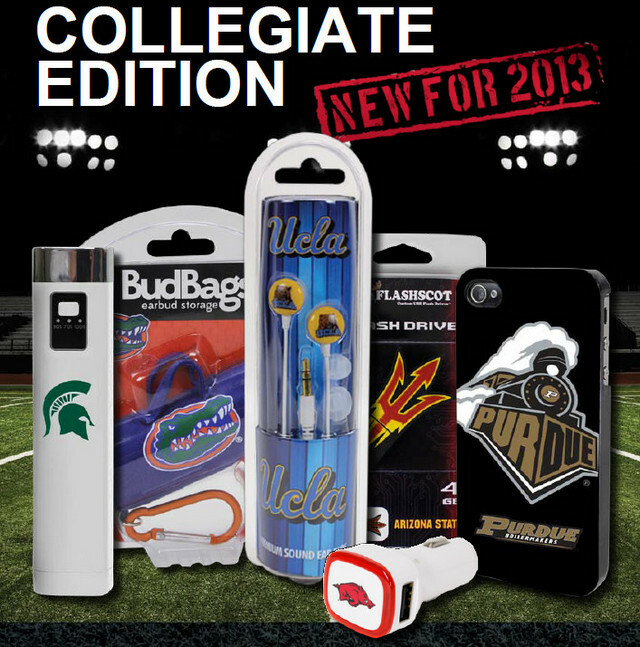 We have teamed up with CLC, LRG and SMA college licensing agencies and over 160 universities to launch BudBags® earbud carry-cases. Featuring iconic college sport team logos, these bright earbud cases are shaped like mini duffle bags – perfect for carrying earbuds and more cool stuff! The BudBags® carry-cases are the newest addition to a complete line of college licensed mobile accessories, including AudioSpice® Earbuds, A.P.U.® Mobile Chargers and Car Chargers, Guard Dog® Protective Cases for mobile devices, Flash Pac® USB Digital Packs and Flashscot® USB Flash Drives. This entry was posted in Events, Products and tagged BudBags, CAMEX 2013, New Products by csmith. Bookmark the permalink.